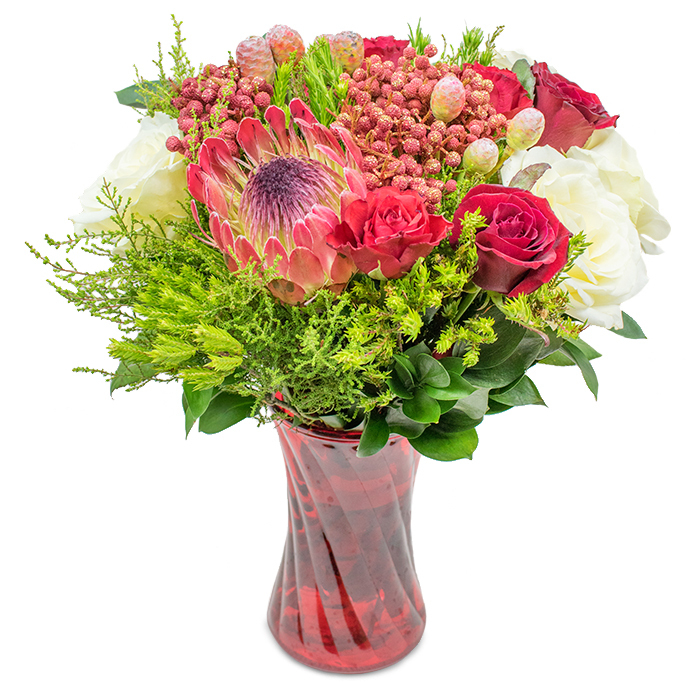 This wonderful collection of cape blooms, lavish red and white roses is sure to impress! Brighten their day sending them this exceptional beauty! Guaranteed to make everyone fall in love with its glamorous look! To sum up, everything from ordering to receiving the flowers was great! No troubles at all! There are so many beautiful flowers on this website that I spent a lot of time deciding which one would be perfect for my wife's birthday. This one in particular might be my final choice. It looks great! Called to ask about the price of the bouquet and the delivery time options. The team took great care of me, paid attention to my needs and provided a flawless service! Ordered the bouquet and it was delivered to my friend's house in London. My friend called to say that flowers were extremely beautiful. Thank you Handy Flowers! Fabulous bouquet! My sister loved it! Two weeks after the delivery, the flowers still look as fresh and gorgeous as they did when they arrived. Amazing! The bouquet was sublime – pretty flowers and ingenious design! Great job!